The Dean River may be the best steelhead river in the world. Its fish are the epitome of wild. 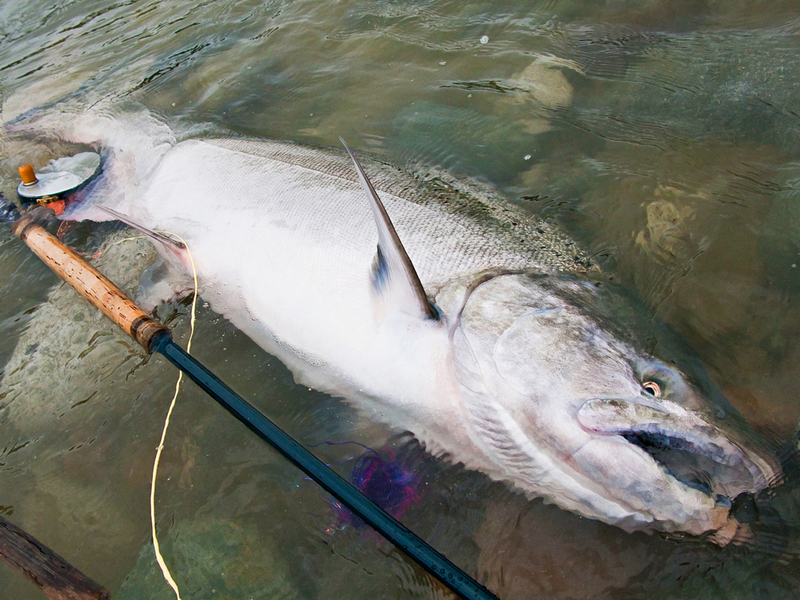 In addition to the steelhead, many guests come up to test their skills at the river's huge and powerful Chinook. 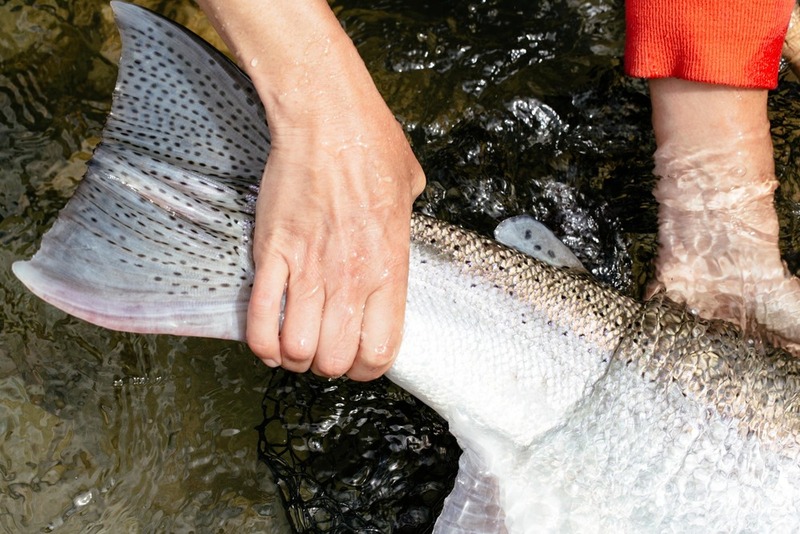 The first three weeks of our season are dedicated to chasing these Sea Monsters of the river, though even in June, early-run steelhead find our Chinook flies. By the third week of our season we are incidentally catching nearly as many steelhead as Chinook. In July we shift our focus to targeting steelhead and are occasionally surprised by a late-run big Chinook. 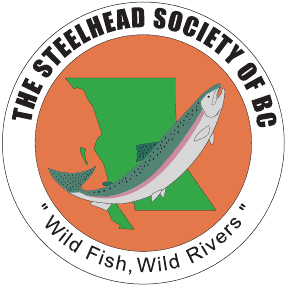 Steelhead season continues strong through August. By mid August we are also seeing Coho intercept our swung steelhead flies. Sea lice with tails are common on our fish, because they are all fresh from the salt. Sea lice are a saltwater parasite that fall off quickly in freshwater. The chrome-bright appearance of our fish is because they were all recently in the ocean and that look is their natural ocean camouflage. You won't find any dark green-backs, oversized kypes, soft hens or double-stripe bucks here. They haven't been in freshwater long enough to change or get tired. Clear fins, purple backs, white bellies and silver sides are the norm. 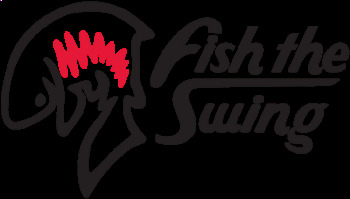 All of our fish are as fresh as anadromous fish come. We know just how special our fish are. That is why Kimsquit Bay Lodge is strictly catch & release only. We encourage our guests to handle all fish with the care and respect that they deserve. We use soft mesh landing nets whenever possible, and we do our best to keep the fish wet and in the water, where they belong. Photos are great as long as the fish is a willing participant and stays partially in the water and away from the sand and rocks. Chinook are not known as the King Salmon for nothing! These fish will test your abilities like no other freshwater fish. They are unimaginably strong, fast and stubborn. Despite common belief, these fish love to eat swung flies. When in the right mood they will eat them on or near the surface and many will come airborne once hooked. If you are lucky, they turn and head back for saltwater as though swimming into the river was a mistake. If you are not so lucky, they run hard upstream and never stop. No other fish can make 20lb Maxima and a 9 weight Spey Rod feel so insignificant. Often times when guests hook their first Chinook, fear is the common emotion as they quickly realize they are not in control at all. When you land one of these amazing animals you will feel the victory of one of fly fishing's greatest achievements. It is on par with summiting Everest. Dean River steelhead are known for their willingness to take flies (dry flies too), amazing aerial acrobats and long, lightning-speed runs deep into your backing. These fish are evolved to be survivors. Their shape alone is perfected to navigate through the heavy white water of the Dean River Canyon and leap several large waterfalls to reach the same gravel areas they were born. Big shoulders, thick wrists and oversized tails are common characteristics. The Dean is not known for having the largest strain of fish, but I think that is simply because the biggest fish on the Dean are simply un-landable. They are without a doubt the hottest and freshest steelhead you will likely tangle with. There are steelhead and then there are Dean steelhead. If you've been here before, you know. These Coho are not ordinary. They are very large by Coho standards, they hold in classic runs and they attack swung flies with reckless abandonment. Many times you will think you are fighting a big steelhead until you get them close enough to see what you are really battling. These mean fish grab hard and run till they taste the salt again. There are many places you can go to catch Coho, but none are as interesting or beautiful as here. Pink salmon, or Humpies as we prefer to call them, bring a ton of ocean nutrients into the Dean River. These nutrients support a vibrant ecosystem surrounding the lower Dean River. Because of the smaller size of the Humpies, most do not make it above the powerful waters of the Dean Canyon. This concentrates them in the lower river and attracts much wildlife to feed on these salmon, which spawn in the shallow waters of the lower river. You will be excited by your first one, but tired of them by your 100th. Much of the time in the later part of our season, you are forced to wade out beyond the humpies so that you don't catch them on every cast. Chum are possible to catch in the river, but most return to the beaches and tidal waters of the Dean Channel to spawn. This is very unique to this area as the abundance of rivers, springs and snow melt create a freshwater lens that sits on top of the saltwater of the Dean Channel. Many congregate directly in front of the lodge. It creates a great visual spawning display for us back at the lodge. At the right tide, you can cast bass poppers and wogs to these fish from the drift wood logs. The fresh ones are aggressive to top water flies. These smaller sized anadromous fish key in on spawning salmon and go crazy for eggs that drift from the redd. They are unbelievably gorgeous and are typically found in the tidally influenced portion of the river, concentrated in the last few runs above the salt. It never ceases to amaze our guests when they attack a fly that is nearly half their size. These little guys aren't the trophy fish most come to the Dean for, but they do play an important role in the aquatic ecosystem of the Dean River. Cutties in the lower Dean are very rare, unbelievably gorgeous and wildly aggressive to the fly. They will smash the fly and give you a bit of a tussle for their size. If you are lucky enough to catch one be sure to admire it closely. They will look very similar to a small steelhead but with their own unique characteristics. Special spotting, elongated noses, teeth in their throat for swallowing juvenile fish and of course distinctive red slashes along their lower jaw.